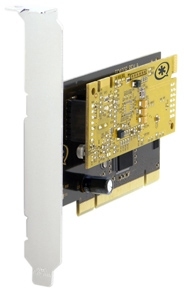 The TC400B is a half-length, low-profile PCI 2.2-compliant card for transforming complex VoIP codecs into simple codecs. Asterisk, in software and with Digium G.729a licensing, is capable of transforming the G.729a codec into other codecs for the purposes of call origination or termination, bridging disparate calls, or VoIP to TDM connectivity. These transformations in software are very expensive, in terms of MIPS, and require a substantial amount of CPU time to accomplish. The TC400B not only relieves the CPU of this duty, freeing it up to handle other tasks or to complete additional call processing; but also provides Asterisk with the capability of bridging G.723.1 compressed audio into other formats, a capability not previously possible. The TC400B decompresses G.729a (8.0kbit) or G.723.1 (5.3kbit) into u-law or a-law; or, compresses u-law or a-law into G.729a (8.0kbit) or G.723.1 (5.3kbit). The TC400B is rated to handle up to 120 bi-directional G.729a transformations or 92 bi-directional G.723.1 transformations. The TC400B does not require additional licensing fees for the use of these codecs nor does it require the registration process associated with Digium's software-based G.729a codec licensing.